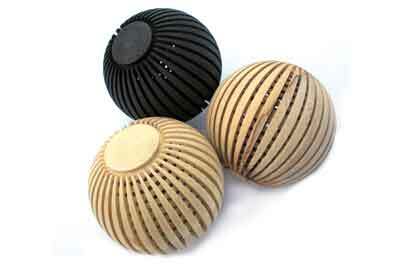 Lattice ball boxes in ebonised, bleached and natural sycamore, 75mm dia. Rod was born in Manchester in 1951. His father was an engineer and his mother a seamstress, so making things was something Rod had been introduced to at an early age. He went to a Technical school where woodwork, metalwork and technical drawing were part of the lower school curriculum and he went on to take metalwork and technical drawing at GCE 'O' level. After studying for a degree in metallurgy at Sheffield Polytechnic, Rod went on to work in subcontract heat treatment of metals in Manchester for six years. Understandably, lured by the clear warm water and his interest in scuba diving, Rod went to live in the Bahamas where he managed to get a job as a metalwork teacher, telling us: "I stayed there for five years before returning to the UK and retraining as a CDT teacher." Rod went to work at the Axminster School, next door to Axminster Tools & Machinery. Even though he was a trained CDT teacher, his previous experience on a woodturning lathe amounted to 10 minutes instruction on how to use a skew chisel, during his teacher training course. 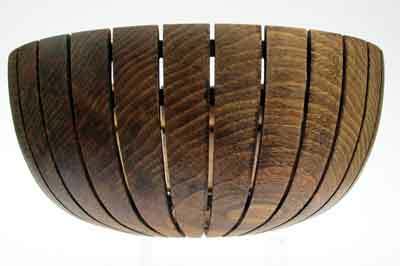 An interest in woodturning began in 1997, when he went to the Yandles show in Martock, Somerset and watched Matthew Calder making large hollow forms. Rod thought he would like to have a go at making one: "I fastened a birch (Betula pendula) log to a faceplate on the Graduate lathe at school and with a home-made hollowing tool, made a hollow form," Rod explains. "The shape wasn't great and I made some basic mistakes, like trying to turn uphill, but it looked OK and I was hooked!" Rod went on to watch Bert Marsh - who he says has had the greatest influence on him - demonstrating at the turning shop in Axminster Tools & Machinery on numerous occasions. Rod would watch and listen to Bert for three to four hours, then return home to his workshop and try to emulate what he had seen Bert do. Bert impressed on him that the form is the most important aspect of the turning, along with an immaculate finish, saying: "He was a delight to watch turn." 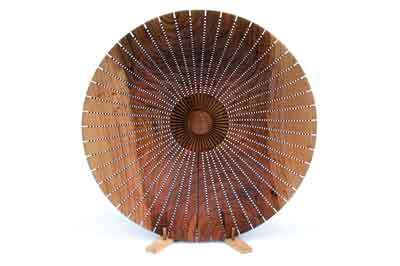 The last time Rod saw Bert demonstrate was at Strictly Woodturning in 2009, where he won first prize in the delegate's gallery with a laburnum (Laburnum anagyroides) lattice bowl. Watching Bert and other visiting demonstrators, along with Keith Rowley's book on woodturning, is how Rod learned to turn - with no formal tutoring from any woodturners at all. Rod comments that he soon left full-time teaching in 2002 to try his hand at being a professional woodturner. Rod usually starts his day with about 30 minutes of yoga. Then, after breakfast, he goes in the shed to do some turning. 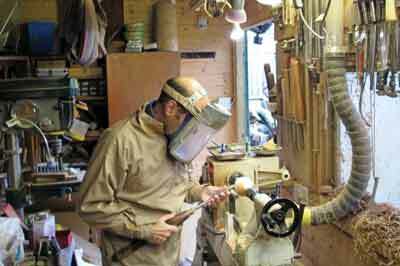 He tells us: "I try to do most of my rough turning in January and February, when things are fairly quiet. I usually listen to Radio 2. Around about Jeremy Vine, I have some lunch and check my emails, then it is back to the shed to do some more turning, or maybe saw up some wood." Rod prefers to use local hardwoods and softwoods wherever possible, getting most of his timber from a local tree surgeon, as well as people who contact him who have had a tree cut down. He also sources timber from a local beach, which can be quite hard on the chainsaw teeth. Generally, he prefers not to work in the shed in the evenings, unless he has some pressing commitments to fulfil. When he first started turning, Rod wanted to make hollow forms, believing 'the larger, the better'. 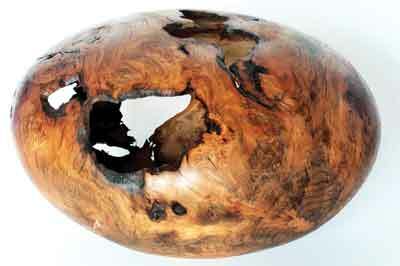 Once he felt he had mastered hollow forms and his success rate had improved from around 40%, closer to 100%, he was turning a large holm oak (Quercus ilex) burr, which he made a little thin around the neck and produced a hole. "I realised," Rod tells us, "that it looked better with the hole in, so the next time I made one I left much more of the surface undulations in place to produce rough-edged holes where I broke through." This led to the creation of natural-edge hollow forms, such at those shown here, where the entry hole cannot be seen. Rod entered this piece in a competition and came second. He realised that to do better, he needed to be more innovative. He explains: "I had seen some coarse turned, 'broken through' lattice pieces produced with an Arbortech cutter and wondered whether I could produce something more reminiscent of Hans Weissflog's 'broken through' turnings using a router." The next competition Rod entered, he won first prize with a lattice bowl and has been refining the equipment and the techniques used since that time. 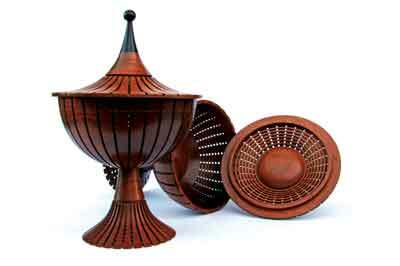 Now, Rod makes all types of turning from commercial items, such as onions, light pulls, earring stands, table lamps, fruit bowls and hollow forms, to more elaborate lattice work and competition pieces. He feels that small repetitive work helps to develop tool skills and production techniques. To promote himself, Rod sells his work in galleries and at art weeks in Somerset and Dorset. He also has a website, which produces commissions mainly for table lamps. It's not just woodturners who have influenced Rod's work. 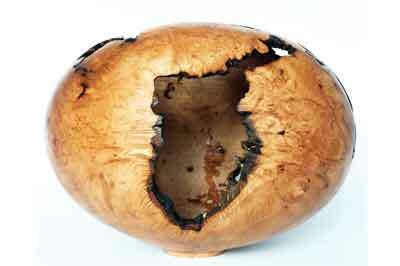 Some of his later scorched pieces were influenced by the work of sculptors, including David Nash and Walter Bailey. He explains: "Ebonising a piece accentuates the form, or in the words of David Nash 'when you see a wood sculpture you recognise the wood, so you get a wood experience before you see the form, but when they are black, you see the form before you see the material it is made from'." 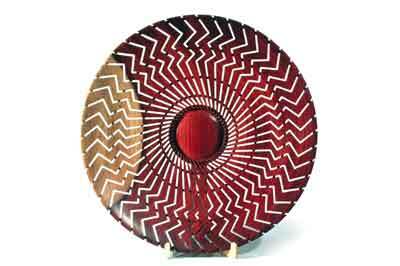 For other inspiration for his turning, Rod tells us he can find it all over the place, from patterns in nature, ceramic pieces, as well as the work of other turners. When asked about the techniques he uses in his work, Rod tells us that he wants to concentrate on the more creative work and develop techniques and tooling. As he explains: "I like to make the form the most important part of the turning. Although size matters, it is not as important to me as the right shape and I will often turn away lots of material to achieve it." He likes to use clear oil or lacquer finishes so that the figure of the wood shows, or sometimes he will use ebonising with either a blowtorch, wood dye, vinegar and steel wool or acrylic paint to highlight a rim or enhance a rather bland timber, but he is not an advocate of painting and decorating his turned objects. "I do use a pyrography tool occasionally, to burn a texture into the timber, and particularly like the effect of branding." Rod's timings for making his pieces vary greatly. The natural-edge pieces in Holm oak take him four days to complete and he completely sands the inside too, which takes a whole day. 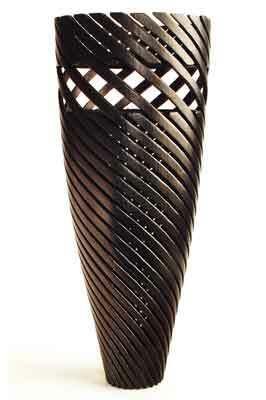 The jatoba (Hymenaea courbaril) chalices took one month from penning the initial sketches to finishing the pair. 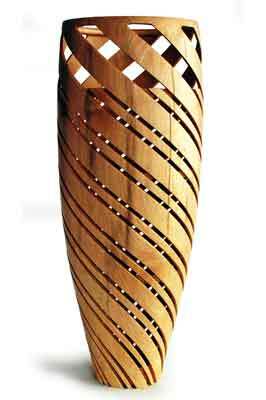 Rod also made a prototype of the chalice, to check everything was feasible before buying the wood. The work involved making an accurate drawing, then producing templates of the important profiles before turning the parts. 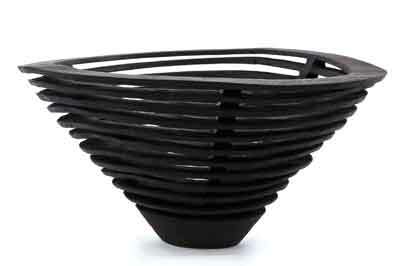 A straightforward lattice bowl takes him one-and-a-half to two days to make. Rod says that he doesn't have a favourite piece to make, but he simply enjoys the experience of cutting a piece of green wood on the lathe using a sharp gouge. One other thing he finds satisfying is starting with an idea of what he would like to make, then developing the method of working, workholding and jigs and fixtures. Another way Rod promotes himself is to enter as many woodturning competitions as possible and these have given him many highs in his career. He also includes seeing his work in magazines and being congratulated by Bert Marsh after winning at the Worshipful Company of Turners in 2010, as two 'highs'. He also explains the lows: "I sometimes find myself overcommitted to producing items for galleries and shops, etc. and have no time to explore the more creative side of the craft. When this happens, I know it is time to re-evaluate what I am doing." Rod moved house in 2002 and one of the main criteria was to have a garage or shed that would take his Wivamac bowl turning lathe. The house Rod moved to had a brick built washhouse, which measured 2.7 x 2.1m and fits the lathe quite well, but without much space for anything else apart from a low cupboard with a bench grinder on top. He needed more storage space, so about two years later - around 10 years ago - he built a 5.3 x 2m shed out of 19mm tanalised tongue & grooved boards with 75 x 50mm framing and a well supported floor, which was able to take machinery. This shed houses his Jet 1642 lathe with bed extension and all the other paraphernalia, such as bandsaw and pillar drill. Rod mentions that the sheds often look quite chaotic, but he usually gives them a good tidy up and sorts out the storage and racking routinely, every January. In between the two sheds, he has a small wood store, which houses his dust extractors so that dust is removed from the working environment. When we asked Rod what tools he couldn't do without, he answered: "I could not do the lattice turning without a router and router base. The router base is one I bought from Axminster and modified it to have a depth stop and a heavier base so that I can use it semi-freehand.â€ He also mentions his Tormek grinder, which allows him to reshape small HSS tools to the profiles he wants and the water-cooled stone stops the fine tips from burning. He finds the whole process is much more controllable than when using a high speed grinder. Of the future, Rod tells us: "I have lots of creative ideas I would like to explore in the future, many of them involve making jigs and carriers for the router, so that I can cut more shapes." At the moment, he has commitments to galleries and commissions to complete. 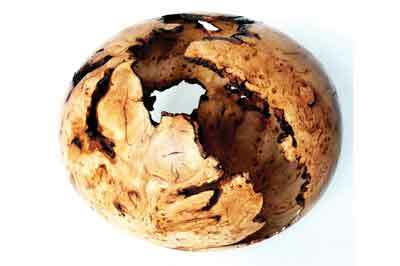 "In one word 'creativity'," is how Rod would describe the best thing about woodturning. Towards the end of his teaching career, he realised that his creativity was stifled even though he was working in a workshop environment, but now he is free to explore whatever takes his fancy. Pick up your copy of Woodturning magazine today!